My name is Anna, I am 12 years old, and I like chocolate ice cream with Oreos. 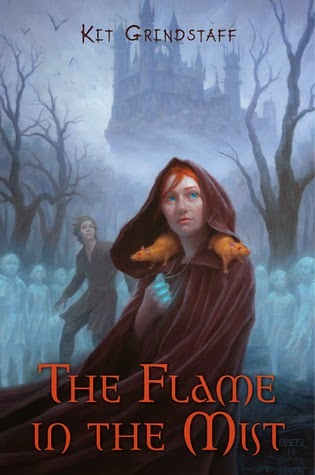 I read THE FLAME IN THE MIST and I chose it because the cover makes the story look adventurous. There are too many to choose just one! I loved Jemma's relationship with her pet rats, Noodle and Pie. Their relationship is much deeper than it seems at first. Jemma is at the center of a plot against her family. I'm not sure what I'd do in that situation. I don't think I'd have enough courage to do what she did. She was very brave. My friends and I recommend books to each other all the time. I'd just tell them that it's really good. I think the cover is cool and creepy. It shows where Jemma is coming from and it foreshadows events that will happen in the story. Yes, please! I wasn't able to put this book down and I'd love to follow Jemma on another journey. This book reminds me of Harry Potter. But instead of Voldemort going after Harry, it is the Agromonds going after Jemma. Just one?!? This book has a crazy story line, every little detail connects to others. How did you come up with the plot and make it all work together? Anna, the basic situation pretty much fell into my head all at once, something like: Girl held prisoner by weird family in a castle miles from anywhere. I was hooked! Then I began wondering: Who is this girl? Why is she there? Where did she come from? Oh, look -- there's a Mist! What's that doing? As you ask those kinds of questions, plot ideas come from the answers. The rest unfolded from there. While writing, I kept asking myself, "What's the worst that could happen now?" That resulted in poor Jemma having a ton of adversity thrown at her! And sometimes, things took me by surprise. The scene with Feo in the dungeons, for example. It did take a lot to make it all work together, though. With so many twists and turns, there were times I thought my head would explode keeping track of it all! I had to check over and over for consistency. Also, whenever a new idea hit me, I'd go back and seed it into earlier chapters to make sure it flowed naturally and made sense when it happened. Like the Feo scene I mentioned: it needed to be hinted at from the beginning. If you were to re-read earlier chapters, you'd see there were clues all along. Keeping the plot unpredictable was definitely a challenge! It was worth it, though, to hear that readers enjoy its complexity. And I'm thrilled and honored that you're featuring THE FLAME IN THE MIST on Kidliterati! Thank you so much. THE FLAME IN THE MIST items for a giveaway. a poster, a parchment, and a "Rattussus Rule!" button. Thank you to Anna and Kit for sharing Jemma's story with The Kidliterati! I love the idea of featuring kid reviewers. The Flame In the Mist is in my massive TBR pile.